The following article was authored by immigration reporter Elizabeth Trovall and originally published on Houston Public Media. Trovall’s work has been featured on Here and Now, Latino USA, Texas Standard and Only A Game. She graduated from University of Missouri’s Reynolds Institute of Journalism, where she reported for the local public radio station KBIA. Follow ElizabethTrovall on Twitter @elizTrovall. 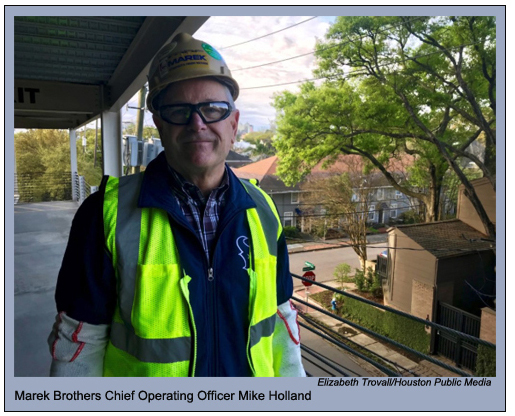 Over the past few decades, Chief Operating Officer for Marek Brothers Mike Holland has seen the construction industry change. He said that as baby boomers retire, it’s harder to find legal skilled labor to take their place. 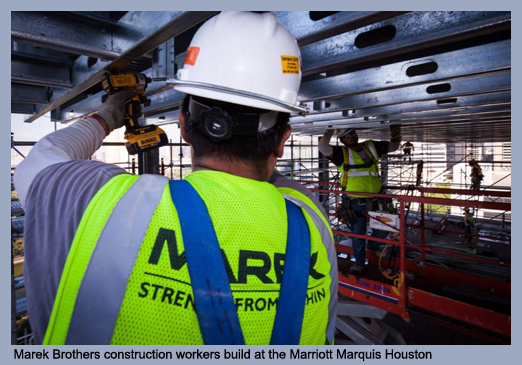 At the same time, Houston has a huge demand for new houses, hospitals and schools, intensifying the critical need for workers in construction. And the industry relies heavily on immigrant labor: Nearly a third of the city’s 300,000 construction workers are undocumented. Holland said if all undocumented workers were deported, it would slow down projects across the city. “Grind to a halt might be dramatic, but the truth is it would be a significant impact on our industry and city and region’s ability to execute that work,” he said. Holland, like many business leaders across the state, are standing up against hard-line immigration policies. “In an economy in a city and state where it’s critical we attract resources, we are, in fact, thumbing our nose at a significant resource and it doesn’t seem to make sense,” he said. Holland believes that if undocumented workers were able to gain legal status, they could receive benefits, training and they would less vulnerable to exploitation. He also said building would be cheaper. “If you tracked the long-term cost of our projects, whether that be public schools, office buildings, things that are very repetitive, that we’re on a spiraling upward trajectory of cost,” said Holland. According to him, the increased costs of design and material contribute to that upward spiral, but not like workforce challenges. “More than any other [reason] a declining quality of the workforce accompanied with declining access to that workforce costs money,” Holland said. The problem with a diminishing legal workforce has even caught the attention of Federal Reserve Chair Jerome Powell. He told Senator Catherine Cortez Masto in a committee hearing last month that curbing immigration could be contributing to higher costs of labor. “I visited Houston not so long ago and I think a big part of their construction labor force was from immigration. I think they were feeling shortages there for that reason,” said Powell. The construction industry isn’t alone in their concerns about how limiting immigration could impact their workforce. Last month, 50 business leaders and associations across the state formed Texans for Economic Growth, a new research and advocacy group. The coalition is asking lawmakers to consider how immigrants contribute as workers, taxpayers, consumers and business owners. Texas Association of Business president Jeff Moseley joined the group and said immigration reform could help fill gaps in the labor force. “There’s need for skilled workers across the board from the service industry all the way to the highly technical workers, because there’s a shortage of workers and nobody that’s willing to work is having a problem finding a job,” said Moseley. He said that every week business owners tell him they’re facing shortages of low and high-skill workers and that immigration reform could fix that. A new Center for Houston’s Future report found cutting immigration by 30 percent could lose the city $51 billion in GDP. If immigration to the region increased by 30 percent, GDP could grow by $67 billion in 2036, when Houston turns 200 years old. “Our foreign-born population is growing at three times the rate of places like Chicago, New York and Los Angeles,” said Brett Perlman, CEO at the Center for Houston’s Future. 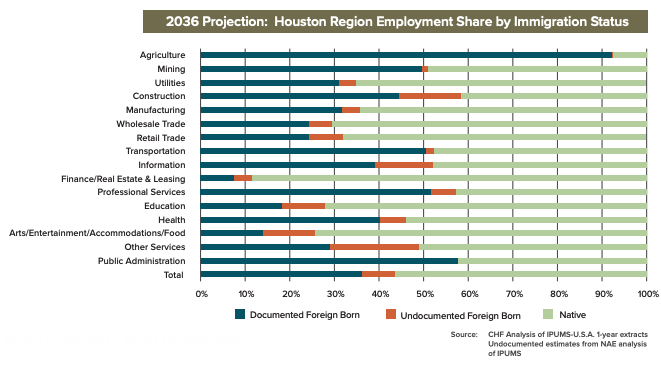 According to Perlman, Houston’s dependence on immigrant labor will grow and not just in the construction sector. “By 2036, immigrants are gonna hold 43 percent of the region’s jobs and 57 percent of the new jobs created will be filled by immigrants, so for us to continue to grow as a community and as an economy, immigration is going to become increasingly important,” he said. Perlman and others worry that fear and rhetoric are preventing sensible immigration policy and threatening the city’s future growth. 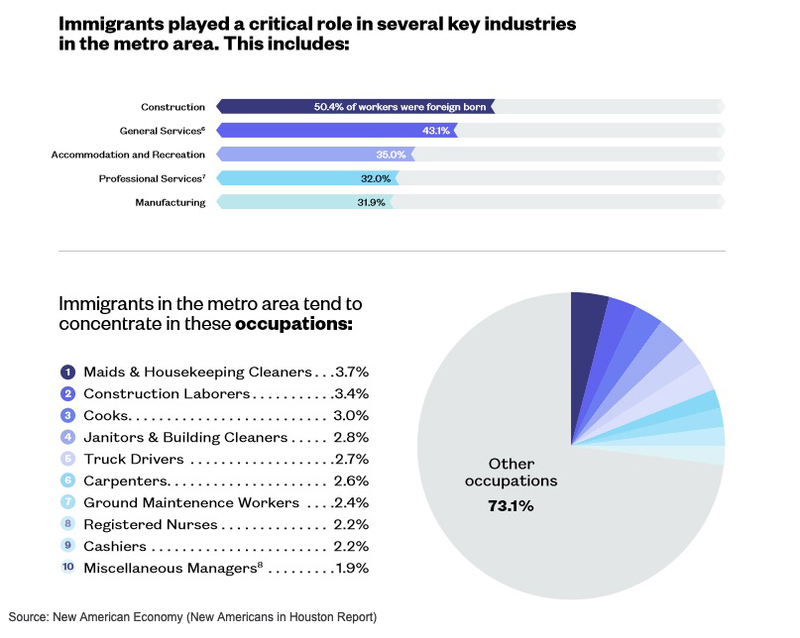 A second report by the think-tank New American Economy found immigrants in Houston produced 26 percent of the local GDP — more than their share of the population. Houston’s 1.6 million immigrants make up less than a quarter of the people who live in the metro area. Researcher Andrew Lim said that they also represent nearly a third of the local workforce. 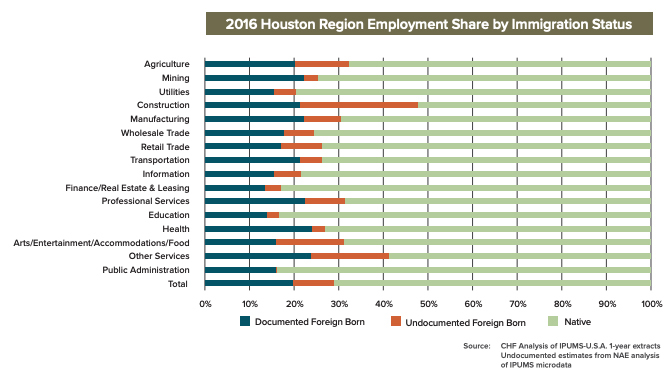 “Immigrants in Houston make up an even larger share of the workforce and that has a lot to do with their demographic profile. They’re more likely to be of working age so they’re not too old, they’re not too young, they’re kind of just right in terms of their ability to contribute to the economy,” said Lim. He and others are advocating for rational, fact-based discussions around immigration that could lead to reform. Texas voters also want lawmakers to address immigration, but are deeply divided on what should be done. When asked about the biggest problem facing the state, a plurality of Texas voters said border security was a priority (second to immigration), according to a recent Texas Tribune poll. A poll from last October found 51 percent of Republicans strongly agreed with immediately deporting all undocumented immigrants, while 50 percent of Democrats strongly disagreed.